A fireplace is the heart of your room and the main focal point. As a result, your fireplace can make or break the aesthetic of your room by either complimenting or clashing with your decor. There are a number of materials and designs to choose from, depending on your needs and style. Whether you have a small living space or a mansion, there’s something for everyone. Stone fireplaces are one of the most popular choices of material. A timeless material; stone is smooth, sleek and extremely durable. A stone fireplace can bring a warm, cosy feeling to your home, which is especially pleasing in the cold, winter months. The stone can also retain the heat coming from the fire which is an added bonus when it’s freezing outside. As a material, stone is very easy to customise, meaning you can choose from all types of design and sizes. You may think that having a stone fireplace means it’ll be grey, but this is not necessarily true. Stone is a natural material and, as a result, every piece of stone is unique with its own patterns and hues. There are many types of stone available, with popular choices being sandstone, limestone, slate and marble to name just a few. Stone is also a very durable material. It’ll last for years with the need for minimal repair & upkeep. It is advised that you do ask for cleaning tips to ensure your stone fireplace lasts for as long as possible. The biggest benefit of having a stone fireplace is that it can really increase the saleability of your home. Most home buyers appreciate the look and feel a stone fireplace gives to a property, meaning it’s likely to sell well. Stone fireplaces really do bring a touch of elegance and class to a home. Wooden fireplaces can provide a calm, romantic and rustic feel to a home. Giving your home a woody aroma whilst hearing the crackling of the wood, it gives the ultimate feeling of comfort and cosiness. Every piece of wood is different, so your fireplace will be unique in terms of the markings and design. There are a number of different colours of wood you are able to purchase to best suit your home. 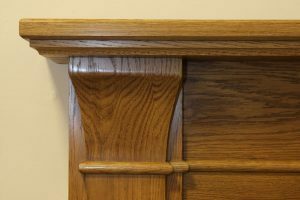 If you do decide to purchase a wooden fireplace, it will need regular care and maintenance which can be costly but is well worth it to ensure your home feels warm and safe. Arguably the most heavy duty looking, metal fireplaces can add style and sleekness to any home. They are among the easiest to install and can instantly transform the look of a room. You are able to enjoy metal fireplaces in a range of colours and designs, meaning there’s something for every taste. When choosing your fireplace, the upkeep is incredibly important. Metal fireplaces can tarnish and are exposed to high heat. Ensuring that all repairs and maintenance are kept updated is critical to its longevity. When choosing a fireplace, there’s something for every style, room and budget. 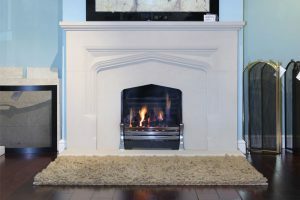 Although there are benefits to all of the materials mentioned above, we feel a stone fireplace is definitely the best all-rounder if you’re looking for a beautiful focal point for your room. To find out more about the selection of fireplaces on offer, make sure you visit our showroom in Syston, Leicester.